In the world's temperate regions, the reproduction of fish generally depends on the season: in other words, it is determined by the temperature. There is only one high season, during which a species usually reproduces only once. In a tropical setting, where variations in temperature are less important, other factors influence on reproduction, especially rain. Fish can lay eggs several times a year, at intervals of sometimes less than a month. 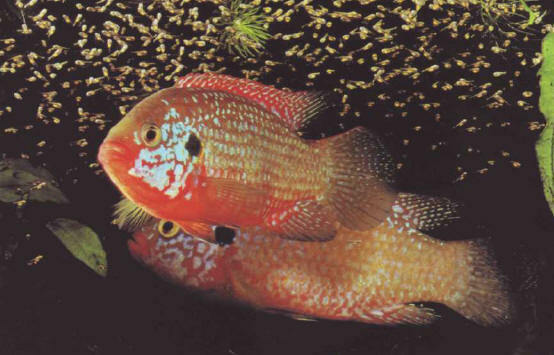 Pair of Hemichromis bimaculatus (jewel cichlid) surrounded by their young. Have well-fed and healthy parents. high-quality water, with characteristics as close as possible to their native setting. Anticipate how you are going to feed the fry. ЮНГ (Янг) Эдуард (1683-1765) , английский поэт. В трактате "Мысли об оригинальном творчестве" (1759) выступил против рационалистической эстетики. Поэма "Жалоба, или Ночные размышления о жизни, смерти и бессмертии" (кн. 1-9, 1972-45) - классическое произведение сентиментализма.